TransportiCA: Send Us Your Book Club Suggestions! Send Us Your Book Club Suggestions! Have any great reading recommendations for TransportiCA's monthly Book Club? Feel free to forward them to us! 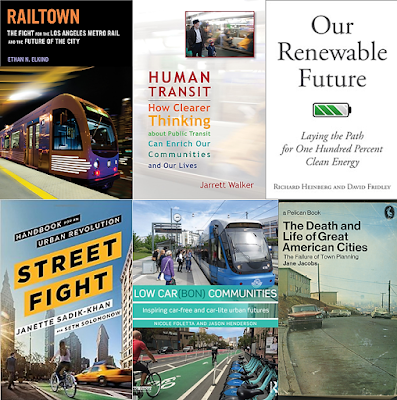 TransportiCA's monthly Book Club selections are true to our mission of sustainable transportation, as well as, covering a variety of additional and related transportation elements: infrastructure and resiliency, transit-oriented development and sustainable economic growth, smart growth and smart cities, shared mobility services, intelligent transportation systems, and many others! We define sustainable transportation as: "Resilient mobility whose input (energy) is renewably-based, financial operations are secure and continuous, and output (emissions) is negative and/or minimal on the environmental and social systems affected by such mobility." If our Editorial Board selects a suggested publication, we will publicize your name with the recommendation. For more information, or to send Book Club recommendations, please email bookclub[at]transportica.info. Thank for your time and suggestions!